How many participants are attending this workshop? For registrations with more than 15 people please contact our office. 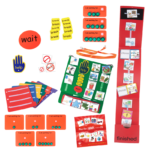 Includes a large PECS Communication Book, a Communication Book Strap, a set of 6 large tabbed insert pages, 20 VELCRO® Brand VELCOIN® Dots, Schedule Board Kit, Universal No Symbols, one Help Card, one Wait Card, a set of 10 Break Cards, and 2 sets of Visual Reinforcement Cards (large and small). 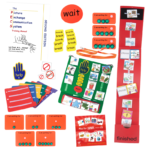 Includes the PECS Training Manual (2nd Edition), A large PECS Communication Book, a Communication Book Strap, a set of 6 large tabbed insert pages, 20 VELCRO® Brand VELCOIN® Dots, Schedule Board Kit, Universal No Symbols, one Help Card, one Wait Card, a set of 10 Break Cards, and 2 sets of Visual Reinforcement Cards (large and small). 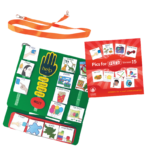 Includes a Large PECS Communication Book, Communication Book Strap, and the latest Pics for PECS CD. 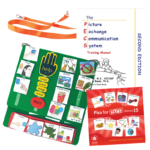 Includes a Large PECS Communication Book, Communication Book Strap, the latest Pics for PECS CD, and The PECS Training Manual. 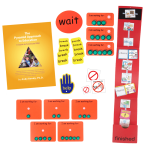 Includes the Pyramid Approach to Education Manual, Schedule Board Kit, 20 VELCRO® Brand VELCOIN® Dots, Universal No Symbols, one Help Card, one Wait Card, a set of 10 Break Cards, and 2 sets of Visual Reinforcement Cards (large and small). 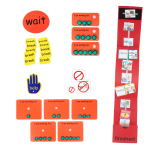 Includes a Schedule Board Kit, 20 VELCRO® Brand VELCOIN® Dots, Universal No Symbols, one Help Card, one Wait Card, a set of 10 Break Cards, and 2 sets of Visual Reinforcement Cards (large and small). All credit card payments are processed and secured by Paypal. Pyramid Educational Consultants, Inc. does not have access to any information about the card of bank account. 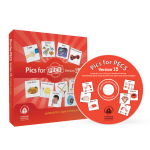 I wish to pay later and will provide a Purchase Order. I will ensure that payment is received by Pyramid before I attend the workshop. Please fill out all required fields. Please select a payment method above.